On AM revitalization, Peter Tannenwald asks, Are we really “revitalizing” AM, or are we walking around in circles? Late on Friday, October 5, the Federal Communications Commission (“FCC”) released a Second Further Notice of Proposed Rulemaking in a five-year ongoing effort to “revitalize” the AM radio broadcast service. The new proposals continue a trend toward allowing higher power operation by smaller stations, by reducing nighttime signal protection for some 60 Class A AM stations located in the continental United States and 16 stations in Alaska. The end result would be less wide area coverage and more local radio service to the public. To understand why the FCC is considering this action, it helps to understand a bit of the science behind AM signal propagation. AM radio signals travel through both the ground and through the air. At night, the airborne signal component (“skywave”) is reflected back to the earth from the ionosphere — a layer of the atmosphere extending from about 50 to 600 miles above the earth’s surface. The reflected signals may come back down to earth hundreds, if not thousands, of miles away from a station’s transmitter. Class A AM stations — formerly known as “clear channel” stations (no relation to Clear Channel/now iHeartMedia) — are powerhouses, transmitting with 50 kilowatts of power 24 hours a day – 200 or more times the power of the smallest AM stations. […]Signal reflection doesn’t work so well during the day, so the FCC has allowed other stations to occupy the Class A frequencies in other markets. But those stations have to curtail power during “critical hours” (two hours before sunrise and after sunset) and often have to reduce power to nearly nothing or shut down altogether at night. In today’s 24-hour-a-day, nonstop world, not being able to reach an audience at night is a losing proposition; so the FCC has yielded to constant pressure over the years to allow more power and longer hours of operation by those “other” stations, at the expense of long distance reception of Class A signals. Click here to read the full article at RadioWorld. This entry was posted in AM, DX, Mediumwave, News and tagged AM Radio, AM revitalization, Bill Patalon, Class A, Clear Channel, Mediumwave, Peter Tannenwald, Radio World on October 25, 2018 by Thomas. Dr. Byron St. Clair, president emeritus of the National Translator Association, died May 20 in Denver of brain cancer. He was 93. St. Clair, who served as president of the National Translator Association for 19 years, is known as the “father of translators, LPTV and low-power FM,” the association said. He worked to serve those living in the mountainous rural western United States with broadcast service and in so doing created a new class of over-the-air broadcasting, which has grown to more than 4,000 stations that serve millions of people. Continue reading at TV Technology online. This entry was posted in FM, News and tagged Bill Patalon, Dr. Byron St. Clair, FM, LPFM, TV Technology on May 26, 2018 by Thomas. GatesAir is suspending the sale of new AM transmitters. When a prominent radio engineer passed along word to Radio World that he’d sought a quote from the manufacturer on a new transmitter but was told the company had discontinued the model and was assessing its AM line, we sought to learn more. Chief Product Officer Rich Redmond replied: “Recent changes in the long-term availability of critical components from our suppliers, including several last-time buy notices, have caused us to take proactive steps to ensure we can meet our continued support obligation of our AM products,” he said. Click here to read the full story at Radio World. This entry was posted in AM, Mediumwave, News and tagged Bill Patalon, GatesAir, Radio World Magazine on March 15, 2018 by Thomas. This undertaking was a collaboration between the station and the National Archives, and it was the first time that such a comprehensive recording of a radio broadcast had been made. The station then donated its original set of recording discs to the National Archives, giving it a rare and complete artifact from an era frequently called the Golden Age of Radio. Due to their historical significance, the United States Library of Congress has since added these sound recordings to its National Recording Registry. Click here to view or download the full set of recordings on Archive.org. Many thanks for sharing this bit of radio history, Bill! As a radio archivist, this sort of thing makes my day. This entry was posted in AM, Mediumwave, News, Nostalgia, Radio History and tagged 1939, AM, American Radio History, Archive.org, Bill Patalon, Radio History, WSJV, WSJV A Day In Radio History on September 21, 2017 by Thomas. 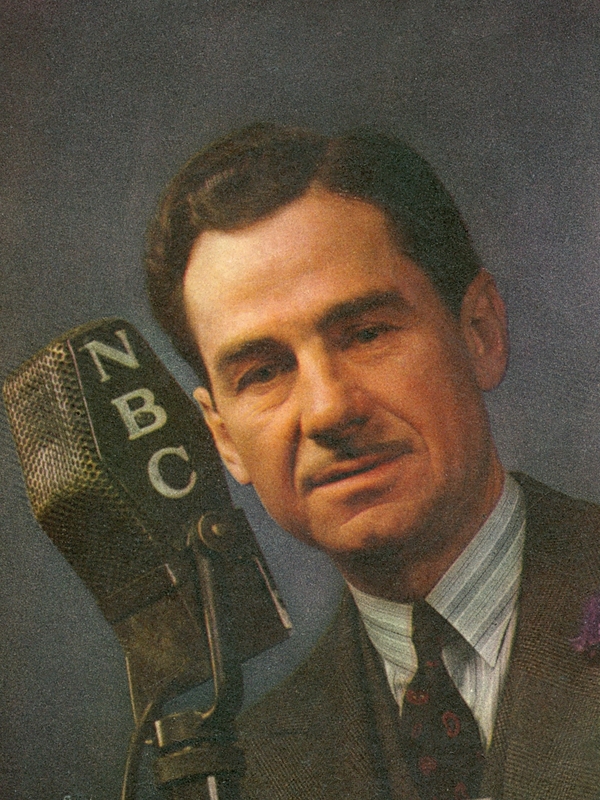 By the time Lowell Thomas turned 25, he’d already worked as a journalist, earned multiple degrees, and found a place on the faculty at Princeton University. But seizing a rare opportunity during World War I changed him from youthful overachiever to media heavyweight. During that conflict he met T.E. Lawrence, soon-to-be famous as “Lawrence of Arabia”—and Thomas played a large part in giving Lawrence that fame. The encounter launched Thomas into the media stratosphere with a groundbreaking multimedia presentation that captivated millions. But while Lawrence’s work ended abruptly with his untimely death, Thomas went on to live a long, remarkable life. He traveled Europe, the Middle East, India, Afghanistan, New Guinea and Tibet, even meeting the Dalai Lama. He made fans out of Queen Elizabeth and Winston Churchill and led a prolific career in the news, making reports by print, radio, and TV—and reshaping them all into more formal, serious mediums. Click here to continue reading the full article at The Smithsonian online. Many thanks for sharing this, Bill! What a fascinating fellow. This entry was posted in Articles, News, Nostalgia, Radio History and tagged Bill Patalon, Broadcasting, Journalism, Lowell Thomas, NBC on June 22, 2017 by Thomas.